Insulating a van is definitely advisable. Properly done it should help to retain heat which is handy in the cooler months and will save you precious energy usage. When hot air comes into contact with a cooler surface it produces condensation, this is not what you want. As they say, prevention is better than cure. I'm no expert but I did learn a few things on the internet about insulation and different products to use. Different types of insulation are as follows. Many brands out there sell this and it can be purchased easily in places like Wickes and BnQ for cheap. The more expensive stuff is the double sided type. This will reflect the heat radiation back into the van and also away from it. So in theory this should help to retain warmth in the colder months and be cooler in the warmer months. It looks like bubble wrap and can be cut to size and is easy to install with some spray glue. This material will not hold moisture and is great to stop cold bridging on surfaces which brings condensation. This stuff can be used as the main bulk for your insulation and comes in different materials such as plastic, glass, stones and sheep wool. Sheep wool would be the preferred material as it traps less moisture than the others but does come with a higher price tag. Be careful with certain materials such as the glass wool, it causes irritation when handling it because of the fibres. You will need gloves and a mask for sure. This stuff is relatively cheap but can be awkward to install. It will need to be glued down to the surface you're applying it to. A downside to this material will be it's inability to hold heat and absorb sound well as unlike a wool alternative. On the upside to this, it's great at not retaining moisture within your walls. Again, lots of different brands out there to choose from. The boards can be cut to size fairly easy. Make sure the fitting is right, if the boards have freedom to move you could get squeaking noises when you drive. Very irritating I should imagine. Foam boards are very popular in modern houses being built. Mainly in the loft. Most come with at least one side covered in a reflective layer which is great at reflecting heat radiation. Like the Polystyrene boards, it can be cut to size. This can be a bit time consuming and the inevitable gaps will need to filled with a spray foam. The material used has very good insulation properties and won't retain as much moisture as some wool materials. Overall this stuff is probably superior in its qualities over the other products, just bear in mind the fitting of this. This can be bought in cans from nearly all hardware stores and is cheap. It's great for filling in gaps between insulation boards or other gaps that seem to appear everywhere. Definitely recommend grabbing a can regardless of your chosen method. I have seen some people insulate the whole van with this stuff. It's great for insulation and doesn't hold moisture but it can be real messy when using it. I don't think I would have the patience for doing the whole surface in this but it's definitely not the worst idea. 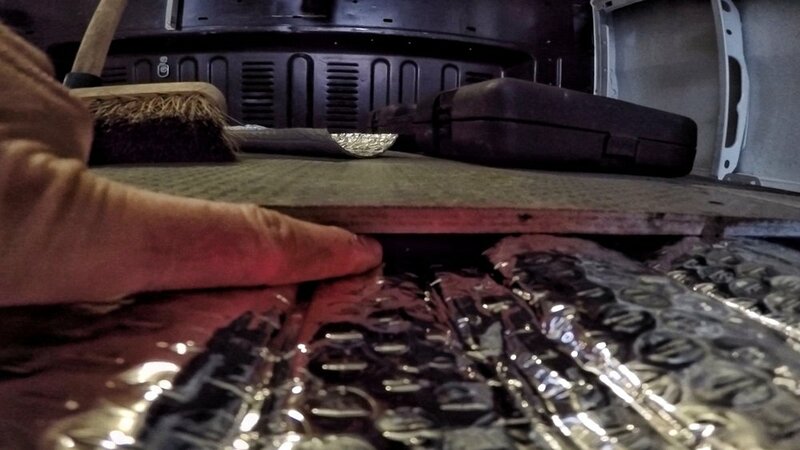 For my van conversion I decided on the double sided foil insulation with a recycled plastic wool. The foil acts as a great barrier to stop warm air touching the cold surface of the metal thus preventing condensation. The sheep wool would have been my preferred choice but after comparing price and other factors such as the insulation rating I chose the recycled plastic option. There is no irritation with this stuff which makes me feel better. I don't like the idea that glass fibres could be floating around inside the van while I sleep at night. The wool is great for insulating as you progress through the build. You can fill all the gaps easily, just remember to give it some room to 'loft' for the best results. I heard a lot about putting in a moisture barrier. They are used a lot in homes as another means to stop moisture getting inside to the insulation. I didn't bother with this barrier in the van. For it to be effective you need to do a great job of sealing it all up with a plastic membrane. This would be very difficult given the intricacies of the van build. I am going to be attaching lots of things to the walls which will create gaps in the membrane. So I decided to not have one and just try the best I can can at keeping the inside of the van well ventilated. If you check out this post I wrote, I go through building the floor in my van. I only used the foil insulation for this as I really didn't want to lose any height in the van. I am tall and retaining the height was an important factor. The floor has a corrugated surface which was covered in the foil insulation. The ply boards were then placed directly on top. This actually creates a natural gap for the foil insulation to be effective. For the walls and ceiling I used the foil wrap again throughout to get that reflective base layer. On top of this I used a spray glue on the walls to attach the recycled plastic insulation. This was real easy and didn't take too long to install. For the ceiling I didn't need glue as I was using tongue and groove style roof panels. So as I went through I could stuff the insulation into the gaps. Very easy to do and no mess. I started to use the spray foam for the gaps and holes in the van, this was easy but get ready to clean up the mess! Thank you for taking the time to read this post and I hope this information helps. Any questions you have please leave them in the comments section below and I'll get back to you as soon as possible. Come join the journey on Facebook, Instagram and Twitter. Throughout my posts I give you links to the products I have used personally or alternatives that can be used for your own build. If you enjoy my posts and found them helpful then perhaps consider buying through one of those links. This is at no extra cost to you but I make a very small percentage in commission which goes into the running of this site to produce more content. Thank you for your support. Do stick your email in the box below to join the crowd that receives a very occasional newsletter of what's happening on the blog. I promise no spam! And it's easy to unsubscribe should you not like the content.